A warm, but heavy, bag at an amazing price. This bag is rated for -20° and I've used it several times, once in the teens and several times in the twenties, every time under the stars either in an open field or on my porch. 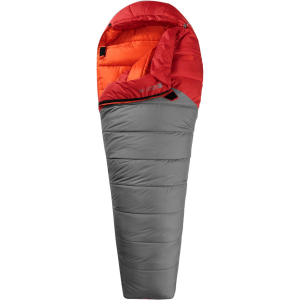 I slept on a 2" self-inflatable air-mat and wore Polartec Powerdry expedition-weight base layer top and bottom, a Polartec Thermal Pro fleece jacket, a merino wool gaiter, a knit acrylic hat, thin acrylic gloves, and heavy wool socks. I didn't notice any drafts either time. The first time, the temperature started around the 20s and the low was 16°F with windchill bringing it down to single digits. It wasn't snowing, but a lot of snow was blowing around. I went to sleep comfortable, though in the morning, I woke up cold curled up near the foot of the bag with snow in the bag's opening. I took my temperature when I woke up and found it to be about 95°F, a bit low. I would take another layer if using the bag in similar weather again. 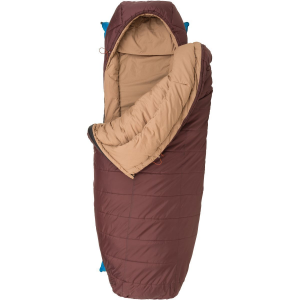 The second time I used it, the temperature hovered around 21 through the night, I kept a down quilt in the bag in case I got cold, but found myself too warm. I took off the gaiter, hat, gloves, pushed the quilt to the bottom of the bag, and put on a thin cap made to wear under a bike helmet. I was fine throughout the night. 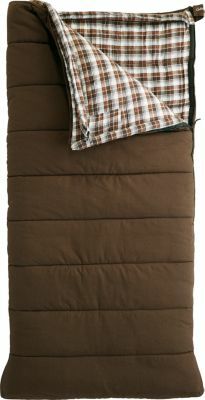 Fit & Comfort: I bought the regular size which has plenty of room for me at 5'4" and 160 lbs. 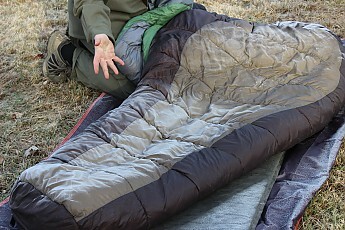 There is ample room for me to use a quilt or possibly another sleeping bag inside it. Entry & Exit: The Desert Pine has a single #8 zipper on the right side, extending from the hood opening to about a 6 inches before the end. There is a velcro closure at the top of the bag which I believe keeps the bag from unzipping on its own. 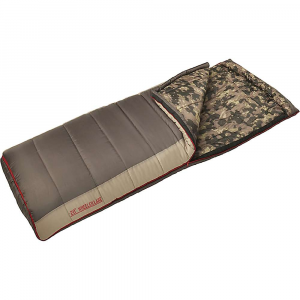 It also has an insulated chest baffle with a velcro closure and a drawstring. I didn't have any trouble getting in and out the bag. Packability and weight: The bag doesn't compress very much, but it fits into its compression stuff sack without a problem and compacts a bit more with the straps. The bag weights over 6 1/2 pounds. I would have preferred the Crescent Lake which was $10 cheaper when I bought this. I think the bags are almost the same, just the Desert Pine has a compression stuff sack while the Crescent Lake has a standard stuff sack. The ALPS Mountaineering Desert Pine -20 is not available from the stores we monitor. It was last seen January 22, 2014	at SunnySports.